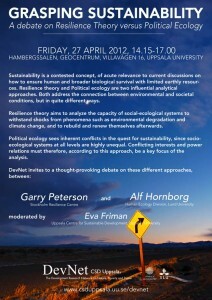 The discussion will be Friday 27 April 2012, 14.15-17.00, Hambergssalen, Geocentrum, Villavägen 16, Uppsala University. More information is on the DevNet website here and here. Alf Hornburg and I previously had an online discussion on this blog where I tried to understand and respond to his critique of resilience, based on a review Victor Galaz had of a recent paper of his. I expect that the discussion will be interesting and I hope that there will be some fruitful discussion. While the discussion has been framed by the organizers as a debate, I do not see political ecology and resilience as opposed. Indeed, I wrote a 1999 paper in Ecological Economics -Political ecology and ecological resilience: An integration of human and ecological dynamics - (doi:10.1016/S0921-8009(00)00217-2) that suggested some ways I thought ideas from political ecology could be included in resilience thinking. While resilience researchers have long argued that issues of power need to be included in resilience thinking there hasn’t been a mass movement towards their integration, but there have been a fair number of researchers how have attempted to explicitly combine aspects of political ecology and resilience thinking. For people that are interested in thinking I’ve stated a group on Mendeley to share papers that attempt to integrate resilience and political ecological theory and methods. Right now there are about 30 papers in there, but I expect there are a number that have been missed, and I hope Resilience Science readers can add them to the group. For those who missed it the first time around, I posted an exposition and review of Hornborg’s book (Power of the Machine) which ends with my take on the ships passing in the night nature of the initial debate between Hornborg and Galaz/Peterson. I’d agree with Garry’s above comment — that the approaches aren’t necessarily contradictory. But I doubt that the resilience community as a whole would be willing to embrace Hornborg’s specific theoretical formulation of the concept of power. There is a huge diversity of theoretical formulations of power. Approaches to political ecology from Paul Robbins, Diane Rochleau, Piers Blaike, Marianne Schmink, and Karl Zimmerer have appeared to better connect with resilience thinking than Alf Hornberg’s, but that still gives a lot of space available to further develop power, especially in connection to resilience ideas. I recommend the Political Ecology text book by Paul Robbins is a good places to start exploring political ecology, as are the series of papers by Peter A. Walker on where are the politics, politics and ecology in political ecology. Really interesting! For those of us who missed it, is there a video or similar we could view?